We’ve combined these ingredients with the flavours and health-giving properties of Cranberries, Seaweed, Probiotics, Spinach and Green Tea extract, creating biscuits that are not only delicious, but also very nutritious. Complementary Pet Food. Keep dry and cool. 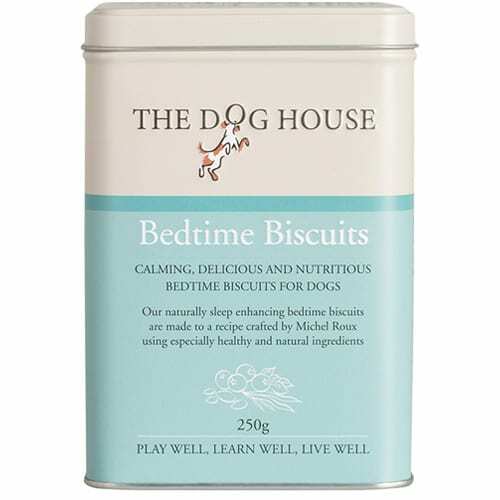 Help your dog wind down and relax with our Bedtime Biscuits. Use as a reward and marker for jumping into bed when asked. 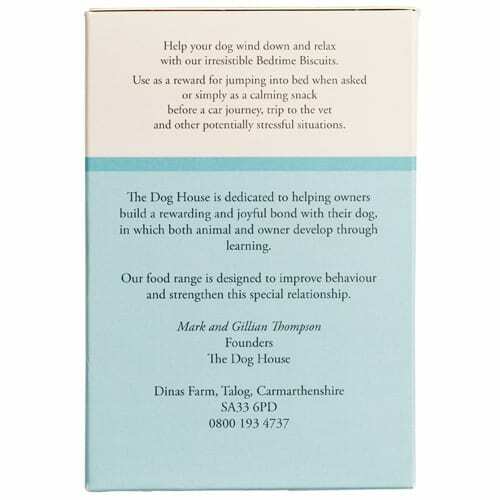 Or as a calming snack before a car journey, trip to the vet and other potentially stressful situations. For a usage guide, view the video clip. 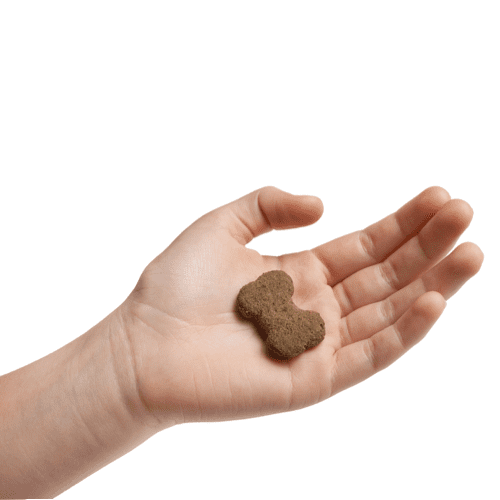 Ever since our puppy came home with us at 10 weeks, we have given him a biscuit whenever we put him to bed, either when we go out for a few hours or at bedtime as part of his training. 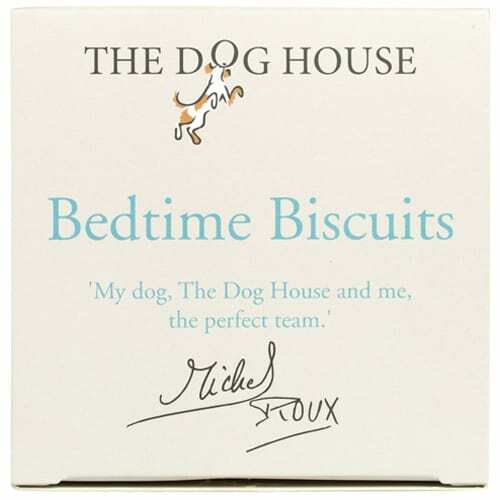 These Bed Time biscuits have now become part of Apollo’s normal daily routine, we hardly even have to say bed anymore, just point and he’s ready and waiting for his biscuit. My 14 year old dog has dementia. Someone gave me some of these biscuits to try, I have to admit I was sceptical but they really seem to help her. She absolutely loves them and settles down for a sleep after having one and that makes them worth the price for me. Ordered yesterday, delivered this morning and great customer service and communication. Thank you. I agree with the previous comments. 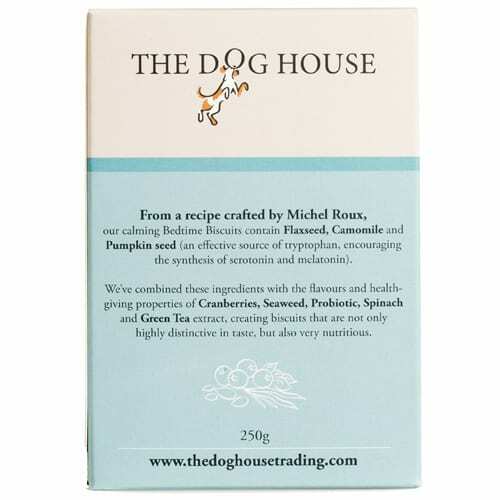 Lulu, a very fussy dog loves these biscuits and we have tried lots! She settles down really well after her bedtime biscuit! 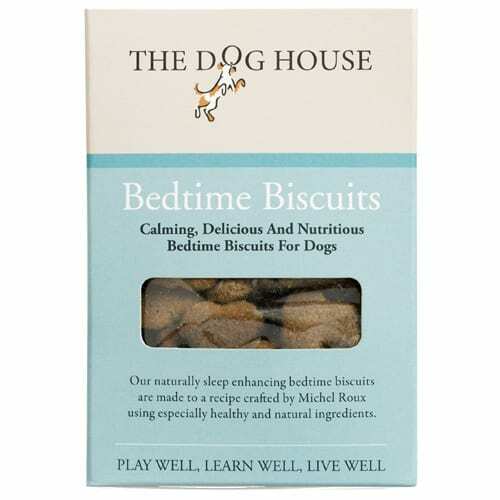 These are excellent bedtime treats – I break up two into four pieces and chuck them in Boris’s bed and he wolfs them down. I’m not sure he’s quite ready to go straight to bed as he’s a young dog but he certainly loves the treats. I love the tin too! I was skeptical also at first – but I really do think these work. My little Dachshund is usually very picky with treats, but he loves his little routine of half a biscuit before bed. And maybe it coincidence but he sleeps brilliantly.